I don’t think there’s much reason for most cyclists to learn how to build a wheel. In general, new factory-made wheels are reasonably priced and not much (if any) money is saved in comparison if you have to buy a rim, hub and spokes for a build. In my case, I also have ready access to very affordable used wheels at Bikeworks, our local community bike shop, which gives me even less reason to build a wheel from scratch. On the other hand, if you have an interest in bike maintenance, wheel building is a fun and satisfying skill in its own right. 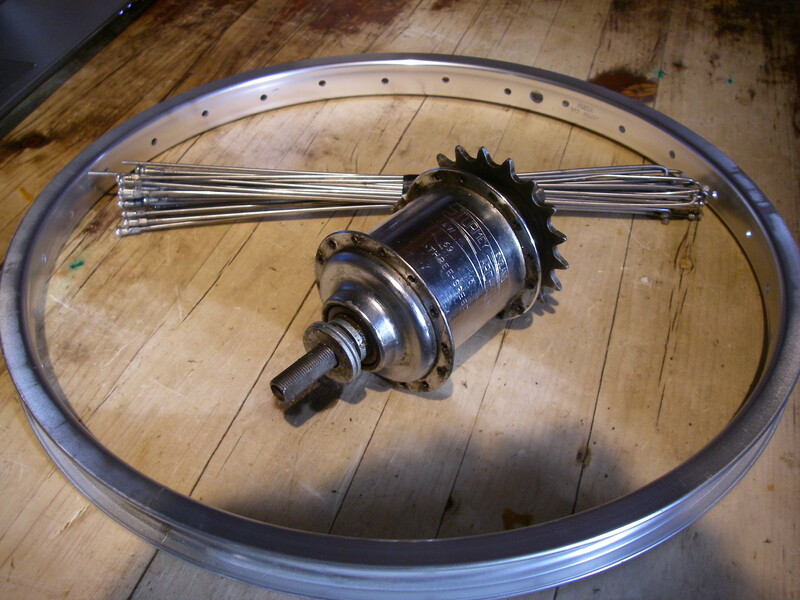 Also, if you are the frugal sort and have a stockpile of used rims, spokes and hubs salvaged from dead wheels, then building one can be quite economical. Finally, depending on what sort of bikes you find yourself riding there may not be suitable wheels readily available to purchase. For this, my 6th wheel build, all those factors were at play, most especially the last one – 16″ wheels with Sturmey Archer 3-speed hubs aren’t that common. I had the rim and the hub. 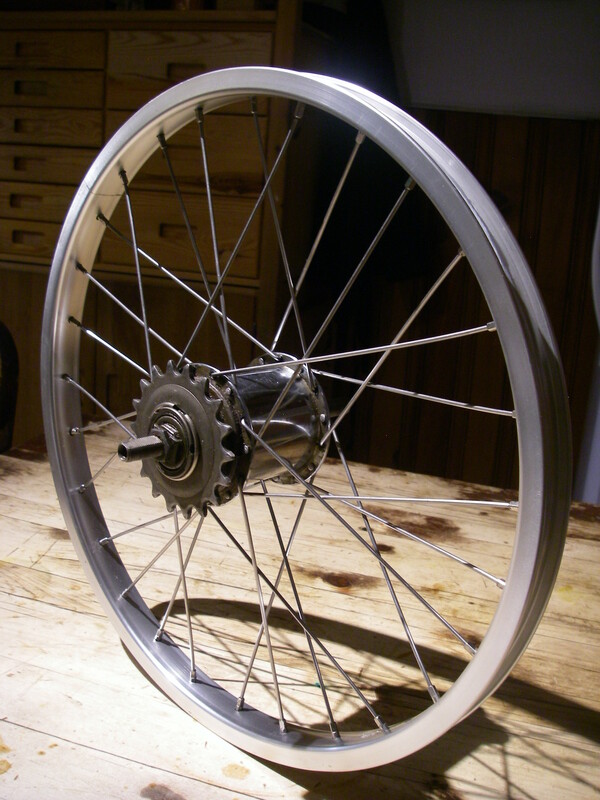 I didn’t have the right length of spoke for such a tiny wheel but I did have lots of salvaged straight gauge DT spokes. Since Bikeworks has a spoke threader, I thought I’d have a go at cutting the spokes to the right length and threading them myself. Hozan Spoke Threader in action. I’ve never used this machine before, but online instructions made it seem simple enough. In practice it was a simple, though very tedious job. 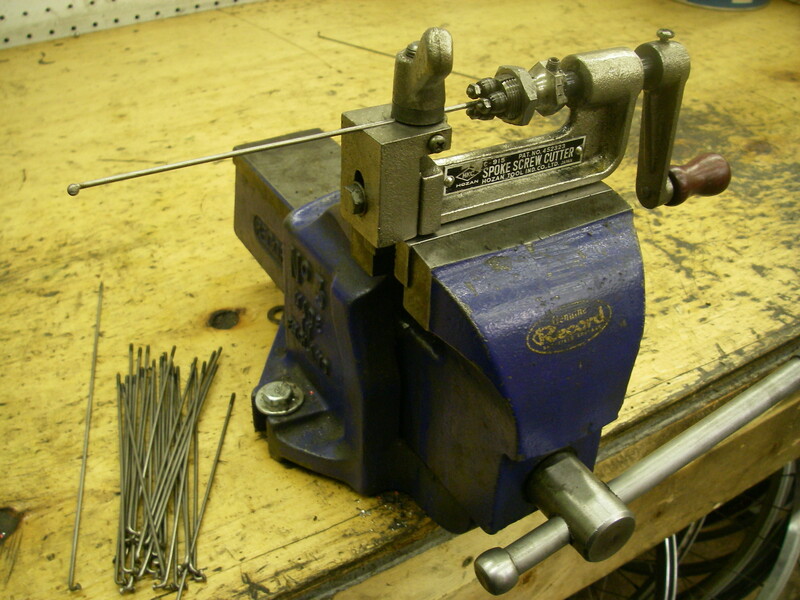 It was made more time consuming by the fact that the thread rolling heads seem to be somewhat worn. After cutting and threading the required 28 spokes, I was hoping that I had calculated the required length correctly, because if they turned out to be too short I might have have to sit down and have a good cry. Happily, the wheel seems to have come together nicely. I still have to bring it back to the shop so I can dish and true it, but it looks like everything will work out. Any readers who can correctly guess what sort of bike this wheel is going on will receive a real bicycle-related prize of dubious value, mailed in a more or less prompt fashion. You’ll need to identify at least the brand and also model or approximate era of the bike. People with a knowledge of the contents of my garage are prohibited from entering the contest. E-mail your answer to tuckamoredew at gmail dot com.